Providing you the best range of taffeta fabric, needle punch fabrics and pure cotton grey fabric with effective & timely delivery. 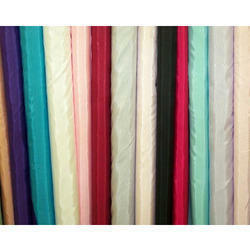 Having a definite quality managements system, we are delivering best assortments of Taffeta Fabric. It is considered to be a "high-end" fabric, suitable for use in ball gowns, wedding dresses, and interiors for curtains or wall covering. This lightweight fabric has a beautiful flocked velveteen damask design. In order to design this fabric as per the latest market trends, our manufacturers use premium quality fibres and modern machinery. The scope of Needle Punch Fabrics that we are putting forth is a delicate and exquisite fabric widely utilised for draperies, upholstery, and bed blankets. Accessible in different hues, these fabrics are pre-contracted with a greatest remaining shrinkage element. 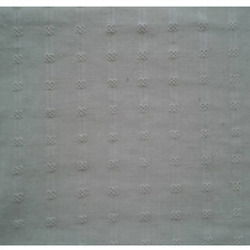 We are the main exporter and production dobby fabric that is a somewhat material made of twofold confronted fabric. This can be exceptionally helpful in making articles of clothing due to numerous reasons. Due to the uprising demands of our esteemed clients, we are engaged in offering a wide range of Pure Cotton Grey Fabric. Our array is quality tested at several parameters and can be perfectly stitched to ensure its long lasting wearing life. The Pure Cotton Grey Fabric we offer is widely worn in parties and get together as they adds beauty to the wearer.